Please type your inquiry in the field below, or browse through the question library. 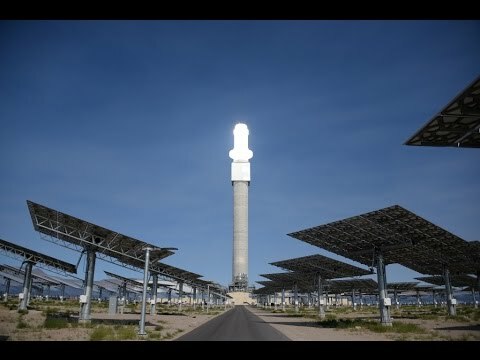 Molten salt is the fluid used in a SolarReserve solar thermal power station to both capture and then store the sun’s energy in the form of heat. The “salt” is a non-toxic, inert, and environmentally friendly mixture of sodium nitrate and potassium nitrate, which in solid form is traditionally used as garden fertilizer. 2) What’s the history of SolarReserve’s molten salt technology? SolarReserve’s molten salt technology, called ThermaVault, is based on decades of R&D, field deployment and lessons learned in real-world operation. The technology was first successfully proven in the 90’s at ‘Solar Two’ – a 10 MW molten salt receiver test facility in the Mojave Desert, developed in partnership with the U.S. Department of Energy. Solar Two became the basis of the design for the Crescent Dunes Solar Energy Project, the first commercial scale molten salt receiver system. 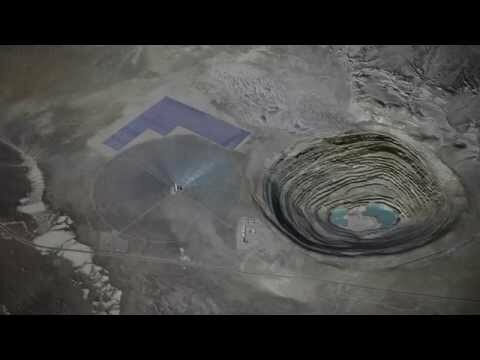 Does the molten salt have to be replaced after a period of time? No, the molten salt doesn’t need replacing or topping up. Molten salt is recirculated and used for the 40+ year life of a SolarReserve power station – without any degradation or need for replacement. Both salt constituents, sodium nitrate (NaNO3) and potassium nitrate (KNO3) occur naturally and can be mined, but both can be chemically synthesized as well. Why do you use molten salt as opposed to another material? Our engineers have determined that today molten salt is the most efficient, reliable and cost-effective way to store solar power at large scale. It’s is an excellent storage medium and, depending on outside thermal conditions, only loses approximately 1% of the energy per day, resulting in 99% energy storage efficiency. Is the salt melted by the sun each day? No, the salt is not melted each day. Melting of the salt is a one-time process, after which the liquid salt is recirculated and used for the 40+ year life of the plant – without the need for replacement or topping up. Temporary equipment is brought on-site during plant commissioning to melt the salt, which is later removed after the process is completed. 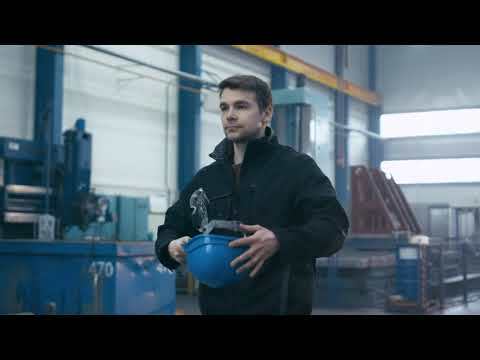 What does molten salt look like? 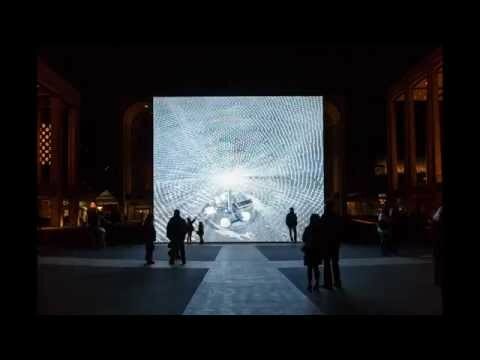 Liquid molten salt visually looks like water – although it’s about twice the density of water. And, unlike water, molten salt remains a liquid and doesn't flash to steam at high temperatures. Is fossil fuel required to keep the salt from “freezing” at night? No, there are no fossil fuels required. Molten salt is circulated through highly specialized piping in the tower during the day, and at night it is drained from the piping and held in a storage tank at the foot of the tower – requiring no fossil fuels. What’s the efficiency of molten salt? Molten salt is an excellent heat transfer fluid, absorbing 90% of the solar energy it receives. The molten salt is also used as a storage medium, and depending on outside thermal conditions, only loses approximately 1% of the energy per day, resulting in 99% energy storage efficiency. How long does the salt stay hot? Depending on outside thermal conditions, the hot salt only loses approximately 1% of its energy per day, resulting in 99% energy storage efficiency. This means that the salt, stored in its thermal storage tank, can stay hot for months. Typically, however, the hot salt is utilized and then replenished each day to generate electricity. 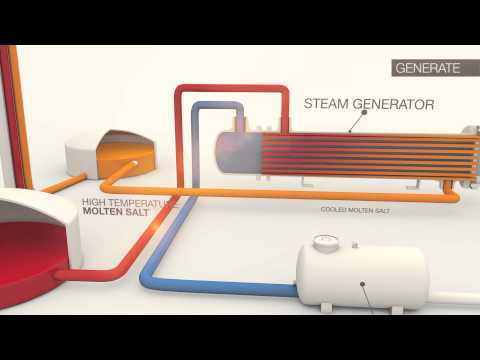 How does hot salt generate electricity? Whenever the plant operators want to generate power, night or day, they flow water through pipes running through a tank of molten salt. The hot salt boils the water running in the pipes into steam that spins the blades of a steam turbine and generates electricity. What’s the history of SolarReserve’s molten salt technology? Yes, SolarReserve holds all rights to the U.S. developed, proprietary technology with over 100 patents and patents pending. The technology uses dual-axis tracking mirrors, called heliostats, that follow the sun throughout the day and reflect and concentrate sunlight onto a large heat exchanger called a receiver that sits atop a central tower. Within the receiver, molten salt flows through piping that forms the external walls, absorbing the heat from the concentrated sunlight. The molten salt is heated from 288⁰C (550⁰F) to 566⁰C (1050⁰F). After passing through the receiver, the high-temperature molten salt flows down piping inside the tower and into an insulated thermal storage tank, where the energy is stored until electricity is needed. When electricity is required, day or night, the high-temperature molten salt is passed through a steam generation system to produce high-quality superheated steam to drive a standard steam turbine at maximum efficiency, generating electricity. The steam generation process is identical to the process used in conventional gas, coal or nuclear power plants. What’s the difference between solar photovoltaic and solar thermal technology with energy storage? Photovoltaic (PV) solar technology converts sunlight directly into electricity using PV cells made of semiconductor materials whereas solar thermal systems concentrate sunlight using large tracking mirrors to capture the sun’s energy as heat in a heat transfer fluid, which then can be stored. In the case of SolarReserve’s technology, that fluid is molten salt. When electricity is needed – day and night – the hot salt is used to create steam, which drives a steam turbine, generating electricity. How does SolarReserve’s ThermaVault technology differ from other solar thermal, or concentrating solar power, technologies? SolarReserve’s ThermaVault technology has integrated energy storage, which is the key differentiator. Other CSP technologies such as parabolic troughs, dish engines, and “direct to steam” power towers do not have integrated energy storage. Some of these technologies have begun to add secondary energy storage to the back end of their systems, but this add-on storage results in significant efficiency losses and increased costs. How long does molten salt storage last? The molten salt energy storage system at a SolarReserve solar thermal power station can ‘charge and discharge’ daily, without any annual degradation, for the 40+ year life of the facility. How does molten salt energy storage compare to batteries? SolarReserve’s ThermaVault technology provides the most cost-effective method for large-scale solar energy storage, while also providing zero-emissions energy generation. Batteries only store energy, so they need to be paired with an energy source – which is not guaranteed to be clean and emissions-free. And although battery technology continues to improve, progress is incremental, and costs are prohibitive for large-scale (bulk storage) installations. Batteries are 5 to 10 times more expensive per kilowatt-hour of storage capacity, especially when considering annual degradation and replacement costs. Can a SolarReserve solar plant operate 24 hours a day? Yes, we have demonstrated that our power plants can run 24 hours a day. Integrated energy storage provides the flexibility to shift electricity generation to meet different profile needs (as specified by the consumer, typically a utility company) and deliver firm reliable power at a high capacity factor. What’s the “Capacity Factor” of a CSP with storage facility? Measured as the ratio of total actual energy produced over a period of time to the energy that would have been produced if the plant had operated continuously at the maximum rating, capacity factor can be as high as 90% in CSP with storage. However, availability for specific peak periods of need is more useful to some off-takers than round-the-clock generation. In other words, capacity factor is less important than meeting the demand requirements of the off-taker (typically, a utility company). When power is needed, does the salt get pumped to the turbine, where it heats the water into steam? Yes, as electricity is needed, molten salt is dispatched from the storage tank through a heat exchanger to create super-heated steam which then powers a conventional steam turbine. The ‘back-end’ of the plant operates just like a fuel-burning power plant that heats steam, except SolarReserve’s technology uses high temperate salts heated by the sun to generate steam and electricity on demand – day and night. 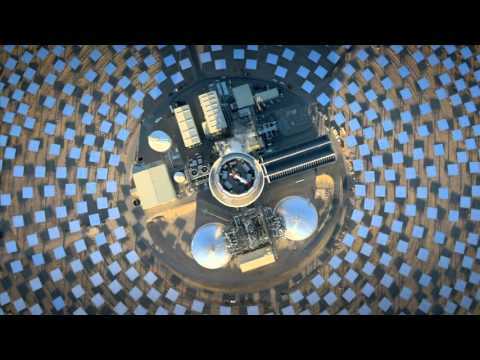 Why do some of SolarReserve’s projects combine solar thermal and photovoltaics (PV) together? With all our solar thermal projects, SolarReserve evaluates the addition of some solar PV to increase capacity and turbine flexibility. Solar PV can supply a solar thermal power station’s electricity demand during daytime hours, which enables the facility to supply more fully dispatchable electricity to the grid and reduces the need to draw electricity from the grid when the facility is not operating. This especially makes sense since much of a solar thermal power station’s parasitic power is required during daylight hours when power from PV is available – for example, PV can be used to power the heliostats that track the sun throughout the day. Heliostats are large tracking mirrors that follow the sun throughout the day and precisely reflect and concentrate sunlight onto a large receiver (heat exchanger). The heliostats are controlled through software and have dual axis tracking; does that mean the mirrors turn to track the sun? Yes, the heliostats turn to track the sun throughout the day, optimizing energy collection. Tracking, or pointing accuracy, is highly precise, measured in milliradians (very small fraction of a degree), as the heliostats need to not only track the sun, but point the beam accurately at the receiver. What’s the genesis of heliostat technology? Much of the fundamental heliostat technology is based on basic orbital mechanics; knowing where the heliostats are planted on the earth. We know the location of the tower receiver from a GPS perspective, and then we know the movement of the sun and the overall mechanics. SolarReserve’s proprietary software, running on a set of dedicated servers, controls and monitors the position of each heliostat throughout the day and calculates aiming points and positioning coordinates every 10 seconds. Each of the thousands of heliostats in a solar thermal power station have on-board computers that resolve the azimuth and elevation position commands that they receive, and use closed-loop algorithms to maintain pointing accuracy. In a given day, millions of individual pieces of data are analyzed to ensure optimal performance. In addition, offline computers and highly sophisticated computer programs process heliostat image and positioning data collected throughout the day, for every day in the year. Optimization routines generate offsets to heliostat aim points regularly fed from the offline computers to the heliostat control system. How accurate is heliostat tracking? Tracking or pointing accuracy of a heliostat is measured in milliradians. A milliradian is a small fraction of a degree. Our heliostats maintain a pointing accuracy of 0.5 milliradians or less, which is less than three hundredths of one degree. SolarReserve’s ThermaVault technology uses tracking mirrors, called heliostats, that follow the sun throughout the day and reflect and concentrate sunlight onto a large heat exchanger called a receiver that sits atop a central concrete tower. Within the receiver, molten salt flows through piping that forms the external walls, absorbing the heat from the concentrated sunlight. The molten salt is heated from 288⁰C to 566⁰C; this high temperature differential stores more energy in less salt compared to other technologies. What material is a receiver made of? A molten salt receiver looks circular, but it actually consists of a dozen or more panels, each made up of about 70 straight tubes. The tubes are a proprietary high nickel alloy steel finished with a high absorptivity black coating. What’s the genesis of receiver technology? The technology was originally developed in the 90’s by scientists at a company called Rocketdyne, a rocket engine supplier for NASA. They had discovered that the technology that goes into the cone at the basis of a rocket engine could be adapted for a terrestrial solar thermal power application. SolarReserve exclusively licensed and strategically acquired the technology. In addition, the industry’s top solar thermal technology experts joined SolarReserve from Rocketdyne. What kind of jobs does one of your projects create? Solar thermal offers a variety of job opportunities from construction, to project and energy technology development and management, to field operations and maintenance. Because a solar thermal power plant operates like a conventional power plant, many of the jobs need the same skill sets as conventional energy jobs – from construction through operations. Learn more about solar thermal jobs. Is local content used in one of your projects? Solar thermal plants use a tremendous amount of local content, providing jobs to local suppliers. Heliostats, for example, must be assembled locally, creating the opportunity for local manufacturing – as opposed to importing solar panels from Asia and elsewhere abroad. What effect do your projects have on the environment? As a renewable energy company, SolarReserve is committed to minimizing the impact of our projects at every stage – from site selection and construction, to full operational use. We subscribe to the “smart from the start” approach and, as part of our project development and permitting process, we collaborate with stakeholders and local communities to ensure minimal environmental impact. This process includes careful site selection, low water use systems, and extensive environmental studies. Our goal is to protect the environment and move forward with our revolutionary technology that displaces more harmful sources of electricity. How do you pick a location for your projects? Many considerations are involved in the land screening process, and ultimately sites are selected that represent what we believe is optimal land utilization with the lowest negative impacts. How much water does a solar thermal plant need? Our solar thermal power stations require about 30% of the water used by conventional power plants that use water to cool the steam cycle, while still delivering comparable baseload energy. Is there any intermittency in the CSP facilities? SolarReserve’s molten salt power tower technology has fully integrated energy storage, which is the key differentiator and enables night time operation as well as daytime system stability – eliminating intermittency issues. What is driving the current interest in energy storage? The global demand for renewable energy generation is expected to grow by 45% by 2020 which would require over $1.1 trillion of investment. As renewable energy penetration grows, the need for utility-scale renewable generation with storage technology is increasingly important to mitigate intermittency problems, deliver power into peak demand periods, and support transmission system reliability. Does the industry still require subsidies/assistance to scale operations? In many markets globally, solar is now competitive with traditional forms of energy – without any subsidies. As an example, in October 2016, the South Australian Government issued an open tender for two power supply contracts to meet its long-term power needs, with 75% open to any dispatchable technology and the remaining 25% intending to drive innovation in dispatchable renewable energy, storage and other technologies. SolarReserve submitted a bid in January 2017 and was awarded both contracts, winning against bidders in both categories – including a number of incumbent gas generators. What are some of the financial, political and logistical risks for SolarReserve when developing solar projects in developing countries? We carefully select our projects in markets with a strong underlying economic rationale in their favor. Working with local partners in locations outside the United States enhances the development process efficiency, reduces delays and has thus significantly contributed to our successful track record. Our projects are structured to minimize key risk exposures, resulting in infrastructure assets with stable cash flows that can be financed using non-recourse project finance. We carefully analyze and, where appropriate, mitigate currency risk and political risk which allows us to secure debt and equity financing at the best available rates. Construction risks are typically mitigated through lump-sum turnkey EPC arrangements with experienced and credit-worthy contractors providing performance guarantees. Similarly, our projects benefit from long-term power purchase agreements (PPAs) and seek to minimize merchant risk exposure. These are all key elements to financing stable infrastructure investments around the globe. How is pricing for a project determined? How is a solar thermal project typically financed? Our solar thermal projects are typically financed under a non-recourse project finance arrangement, which is the typical structure for energy projects. They are financed by lenders who will provide debt to the project, and by investors in the project as equity, including SolarReserve. What are the compelling reasons for adoption of solar thermal with energy storage? Solar thermal can meet peak demand with “bulk” storage, which usually extends well into the evening hours. Solar thermal can efficiently handle 10-15 HOURS of storage without degradation and requires no replacement of the storage medium over a 40-year project lifetime. While battery technology is improving, its application is primarily for shorter periods of storage such as 10-15 minutes, and has to deal with degradation and battery replacement issues over the project lifetime. Solar thermal’s installation costs are rapidly declining, resulting in competitive pricing with other dispatchable forms of energy supply, including natural gas. CSP is already much less expensive than building new coal or nuclear projects. Solar thermal can provide greater local economic benefits, including a high level of local content, labor and service localization. And because a solar thermal power station operates like a conventional one, many of the jobs needs the same skill sets as conventional energy jobs – from construction through operations. Why will the cost of solar thermal projects continue to fall? Economies of scale due to increased manufacturing. How much energy storage does a solar thermal facility provide? Each solar thermal facility delivers thousands of megawatt-hours (MWh) of energy storage. For perspective, over 90% of the world’s utility-scale batteries in operation today provide less than 10 MWh of energy storage. Less than 1% are over 100 MWh. The massive 1,100 MWh of energy storage at SolarReserve’s Crescent Dunes facility in Nevada alone is larger than all the 300+ utility-scale battery installations across the U.S. – combined. Where is the biggest opportunity to cut costs in a solar thermal power project? One of the biggest areas of capital cost savings is in the heliostat field, which can account for more than 40% of the total project cost.